FIBER, Amsterdam based audiovisual network festival, has been invited by the Netherlands Media Art Institute (NIMk) to curate an exhibition that reflects artistic developments within their network of up-and-coming audiovisual artists and designers. 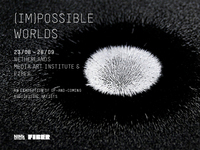 The exhibition ‘(Im)possible Worlds’ will run from August 23rd until September 28th. On Thursday evening, August 23rd. 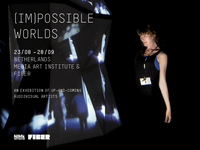 ‘(Im)possible Worlds’ will open with a full audiovisual programme. 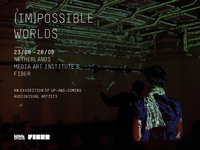 FIBER, the Amsterdam based audiovisual network festival, has been invited by the Netherlands Media Art Institute (NIMk) to curate an exhibition that reflects current artistic developments within their network of up-and-coming audiovisual artists and designers. 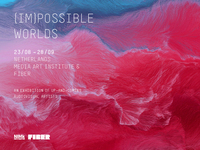 The exhibition ‘(Im)possible Worlds’ will run from August 23rd until September 28th at Platform 2. 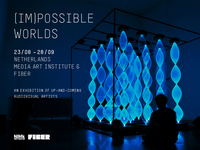 On Thursday evening, August 23rd, ‘(Im)possible Worlds’ will open with a full programme that consists of a real-time sculpture performance with surround sound ('Integration.04') by Dieter Vandoren and an ambient music set played on two Nintendo DS’s by AuxPulse. FIBER DJ’s Dubberdink and Fafi Fabi will conclude the night with some deep electronic sounds. The five installations in ‘(Im)possible Worlds’ blend the physical real with the virtual nature of the computerized world, resulting in new realities that might be perceived as material, but remain intangible. In the case of moving images, the apparatus acts as a mediator between the (im)possible worlds displayed and the tactile and emotional experiences they invoke in the audience. Using computer systems, the interdisciplinary artists construct audiovisual and material representations of light, sound, movement and space, that allow the experience of alternative notions of reality. With the on-going meta-art project 'Databooth' by Sietse van der Meer (FIBER) and Heinze Havinga (Left Foot Media) FIBER also presents these works in the virtual domain. Real-time data from the artworks is harvested and shared as open datasets on COSM, making this the first exhibition with its own API. Developers are free to use this input to create new works of art. Another manner for new media artists to unleash their creativity, is by developing artistic applications. Artists like Rutger Muller and Peter Kirn have therefore been invited to curate an app-gallery with artistic tools that are just a touch away. 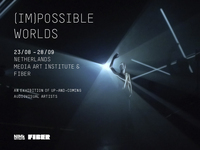 NIMk and FIBER invite everyone to join the opening of ‘(Im)possible Worlds’ and to explore the installations, meet the artists and enjoy the performances at the wonderful building that (for now), still houses the NIMk.